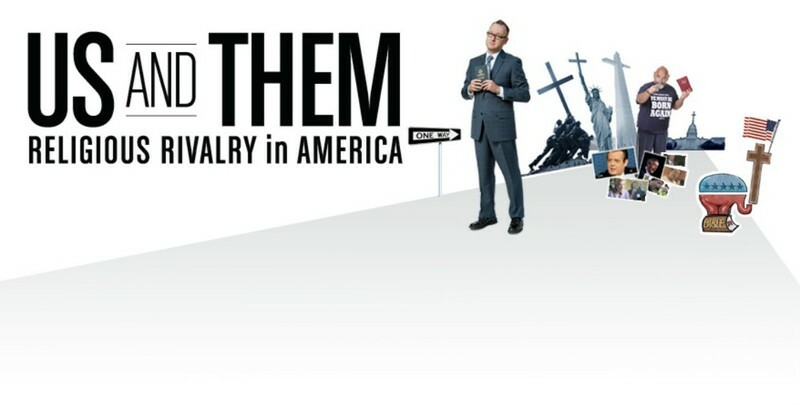 From www.usandthemdocumentary.comThis very thoughtful documentary is about the religious divide in America both politically and doctrinally with regards to the Mormon (LDS) religion. Being a street preacher myself primarily to the Mormon people and knowing some of the other preachers in this film, I was fascinated watching it. I highly recommend anyone interested in Mormonism to watch it. LDS writer, producer, and director Bryan Hall has done a huge service for both Mormons and Evangelicals. For LDS, he humanizes the obnoxious preachers and gives an example of taking Jesus’ command seriously by actually loving even one’s enemies (Matthew 5:44). He interviewed a number of Evangelicals and never came across defensive or dishonest in his beliefs. He put himself in very uncomfortable situations all for the sake of understanding and loving those very opposed to his faith. For Evangelicals, he was also a good example of loving your neighbor or enemy. That entails so much more than simply verbally preaching the gospel to the lost. A good bit of the film dealt with the intensity raised against LDS like never before in our lifetime with Mitt Romney’s run for president of the United States. Mormonism was being investigated and castigated from primarily Christians whether they were of the political left or the political right (the focus of the film is the attacks of the “religious right”). Because of this, Hall began to hate all Christians, not just the street preachers at the biannual LDS General Conference. Even when he agreed with what they were saying, he hated them because they were the enemy. He wondered how they became so un-Christian. At this point, Hall reflected on what Kennedy went through as a Catholic when he ran for the presidency. He also took a lot of heat from Protestants at the time. Hall began to sympathize with someone who was of a different faith tradition. Kennedy got elected, and is still our only Catholic president, but of course he was assassinated, and Catholics took it personally. The fundamental problem persists in America to this day. Hall then played clips of Christians who think that since America was established as a Christian nation, therefore we shouldn’t have another person of faith lead this country. Romney dropped out in the 2008 race, and the focus shifted to attack Obama as a Muslim or at least a pseudo-Christian. Republican Colin Powell expressed his concern that members of his own party suggest that Obama is Muslim. So there seems to be a bias toward republicans who hold this view. Later, Hall uses the elephant symbol of the Republican Party to castigate the leaders of the religious right that will not tell the truth about Obama’s faith. However, we know today (two years after Hall’s documentary) that a majority of democrats also question whether Obama is actually a Christian. Regardless of the party, the focus is on the Christian rhetoric being a knee-jerk reaction against those who don’t share their same faith. As further evidence, Hall told the story of the first Hindu to open a session of Congress with prayer. When the Hindu got to the podium to pray, Christians began to interrupt him with prayer and preaching in the name of Jesus. The idea again is that this is a Christian nation, it was founded by the Sovereign Lord, and other religions cannot give us freedom of religion. Therefore, a Christian should always be ruling in the government and this really turns out not to be the land of opportunity for those of other faiths. Hall’s attitude toward Christians seemed to lighten up a bit after he interviewed Christian constitutional lawyer David French. He is the former president of the Alliance Defense Fund, established to defend the rights of Christians. French is an example that not all Christians have this oppressive understanding of our government. He is theologically conservative, but he stands behind the First Amendment, which doesn’t break citizens up into upper and lower classes. We are all equal in terms of the law. Other faiths have the right to vote so long as they are citizens. The interruption of the Hindu prayer, he said, was simply rude, un-Christian, and abhorrent to our constitutional structure. Hall next took us on a brief historical journey of religion and political power. The focus was on the founding of America in the context of religious freedom contrary to the assumption of the rule of only one religious power. This new American system was established to guarantee its citizens the right to even become president regardless of their faith tradition. Despite the founding of America, its citizens soon forgot about this and began persecuting Mormons by killing them and forcing them out of what was then the United States. Now at this point, you may be tempted to think that Hall is simply doing special pleading for his faith community. However, Hall perceptively turned his mirror on his own people. LDS were bending over backwards to convince us that “a candidates [sic] faith should not be the DETERMING FACTOR as to whether or not you vote for them.” However, Utah, which is around the neighborhood of 70% LDS, voted for Romney almost 90%! Hall found the “us vs. them” perspective isn’t simply a matter that Evangelicals have to wrestle with. So for Hall, it seemed that we all are talking past each other and building walls against each other. He claimed that since no conversions really happen as a result of all this rhetoric, the whole system needs to change. He assumed people like Baptist minister Dr. Robert Jeffress have “contempt” for LDS. Hall still has this “anti-Mormon” mindset in place toward those who speak out against Mormonism even though he commendably reaches out to “them.” He reaches out to them by telling himself that people like Jeffress 1) have good intentions and 2) simply don’t understand LDS. However, at this point I think Hall was being a little condescending and myopic. What was missing in Hall’s story is any account of conversions from one faith to another, and especially on the basis of the preaching and arguments. Many examples may be given here. Please see our own Testimonies page on this site. In fact, emeritus LDS Church Historian Marlin Jensen has admitted that LDS are leaving in droves and the primary cause for that is the internet. Given the fact that a number of conversions happen on the basis of information, it seems that a better presumption to have toward those who don’t agree with me is not only that they have good intentions, but perhaps they really do understand me, and perhaps they have truth that I desperately need. If that’s the case, then what’s the argument to support and convert me to their point of view? Of course there’s still a presumption we all have toward our own point of view. However, if there is not at least an acknowledgement of one is innocent until proven guilty by the preponderance of the evidence, then we all will be more in love with how we feel rather than being open to what another may intellectually bring to the table. Good for Hall opening himself up and allowing himself to be friends with those who oppose him. Hall focused on the parable of the Good Samaritan to motivate this endeavor. He seems, though, too focused on specific actions while overlooking the fact that preaching and arguing may be ways to act lovingly to our neighbor. The point of the parable isn’t simply to provide physical and emotional needs to a neighbor in need. Rather, the point is to provide any needs a neighbor may have. So if we see our neighbor headed to hell, then of course we should attempt to deter that… not only by our meeting his or her physical and emotional needs, but also by meeting his or her spiritual needs. That happens by preaching, teaching, and yes, by even arguing. Hall ended the film on a very personal, friendly note. He told his own story of loving the street preachers, particularly those outside General Conference. He got together with them for some meals, but more importantly, just to get to know them as people and find out what makes them tick. He didn’t argue with them; he just wanted to listen. As a result of this, Hall has become good friends with one of them in particular—Ruben Israel. Hall no longer considers them his enemies. No, he hasn’t converted, but he has proven that it is possible to genuinely love those that are quite offensive. For more information, please visit the film's site.